I like to be ready. Normally, this translates into having something versatile in the fridge, some sort of ‘mothership’ that could turn into a couple of meals in those situations where everybody’s forgotten about eating, but suddenly become really hungry. For this reason, I tend to over-order, to buy a slightly bigger joint than strictly necessary, with one eye on the leftovers. I bought a rib of beef the other day from the butcher’s, and got a choice of where the line of the knife should go … tight up against the rib, or further over towards the next one. I opted for as much meat on the cut as possible, causing the butcher to note that he needed more customers like me … he mused that when he cooked rib of beef, nothing went to waste anyway, so he saw where I was coming from. This pork is another of those ‘fridge recipes’, something I make in quantities far larger than is strictly necessary, simply because having char sui pork sat in the fridge is the very definition of A Good Thing, huge, glistening chunks of belly, red from the marinade and charred from the grill, just ready to be sliced and carved and secretly eaten in the middle of the night. 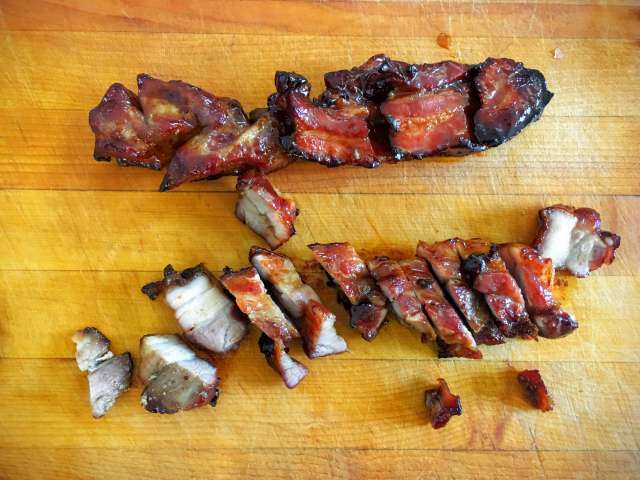 Many parts of the noble pig can be char sui-ed, but my cut of choice is belly. I slice away the skin and cook that separately as crackling (wasting it would be a crime against gastronomy), and leave as much fat behind as possible, fat that will sear and blacken under the grill, melting and keeping the meat moist and succulent. If the cut of belly you choose comes on the bone, cut these away too, but follow the steps here and get them marinaded for a small number of some astonishingly good spare ribs. Those are for the cook. The first thing to do is to prepare the pork, a big slab of pork belly, trimmed of the skin, and removed from its rack of ribs, a kilo or more in weight. Keep the skin. Douse it in salt, place it in a tray and roast until it shatters under the slightest pressure. There’s no point throwing the base ingredient for a bowl of bonus pork crackling away. Slice the pork into thick slices, perhaps four or five centimetres across, and make alternating and opposing diagonal cuts in the meat, so that it flays open and creates a far greater surface for the marinade to infiltrate. The marinade itself is simple – in a large bowl, mix together two tablespoons of hoisin sauce, two tablespoons of ground yellow bean sauce, four tablespoons of light soy sauce, a tablespoon of Shaosing wine, and a teaspoon of salt. Turn the pork over and over in the marinade until it’s covered, and leave covered in the fridge for at least a few hours, preferably overnight, turning the meat occasionally. If your pork came on the bone, give the bones the same treatment. 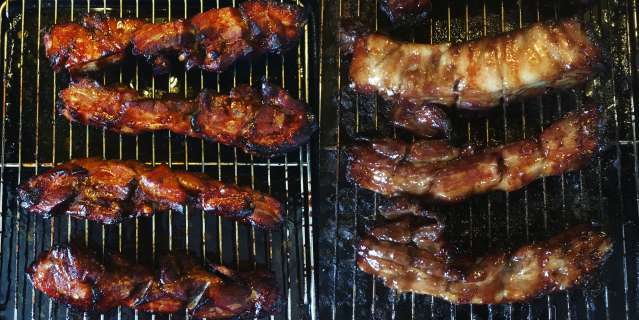 To cook, place the strips of pork on a wire rack over a roasting tray, with some space between each strip, and add some water to the bottom of the tray. Roast at 190c for about thirty minutes, then use a pair of tongs to turn the meat over, and a pastry brush to baste with more of the marinade. Roast for another half an hour, until the meat is cooked and the fat starting to char. To finish, brush the meat with honey, slice and serve, or let it go cold and use in anything from a stir fry to a sandwich. This recipe came from Yan Kit’s Classic Chinese Cookbook, a book published in 1984, and one of the best guides to cooking Chinese food at home you’re likely to find.